Followed by the lunar eclipse on July 07th 2009, the most powerful eclipse for this year happens on 22nd July 2009. 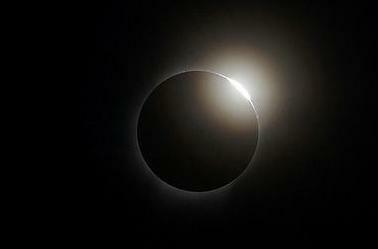 This eclipse is called as total solar eclipse and it is sixth total solar eclipse for this decade. A total eclipse occurs when the Sun is completely hidden by the Moon. The intensely bright disk of the Sun is replaced by the dark silhouette of the Moon, and the much fainter ring called corona is visible. This eclipse is a 6-minute plus eclipse—the longest of the 21st century. The eclipse is seen initially in India and it traverses through Nepal, Bangladesh, Bhutan and China and across the Pacific Ocean. Hence the major part of the eclipse occurs at eastern Asia, Indonesia and Pacific Ocean. It is safe to observe the total phase of a solar eclipse directly with the unaided eye, binoculars or a telescope, when the sun is completely covered by the Moo. In fact this cannot be viewed thorough the filters as the light will be very dim. 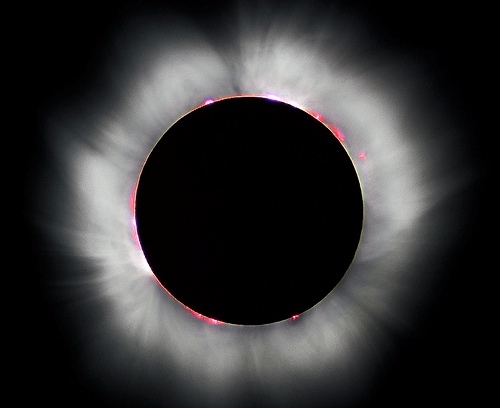 At this point of total solar eclipse the sun will be completely hidden and just a ring will visible which is nothing but the corona of the sun. When the shrinking visible part of the photosphere becomes very small, Baily’s beads will occur. It has been named so as the image formed because of the sun rays looks like beads. This is caused by the sunlight still being able to reach Earth through lunar valleys, but no longer where mountains are present. After this begins the Totality with the Diamond Ring Effect, which emits the last bright flash of sunlight. The following are few of the places where the total solar eclipse on 22nd July 2009 can be experienced. All timings mentioned here are local timings of that place. Photographing such total solar eclipse is possible with fairly common film camera equipment. In order for the disk of the sun/moon to be easily visible, a fairly high magnification telephoto lens is needed (70-200 mm for a 35 mm camera), and for the disk to fill most of the frame, a longer lens is needed (over 500 mm). For those who are interested in photographing the total solar eclipse, here are few tips to make your photographing fruitful. Viewing the Sun after totality can be dangerous. Hence do not view the sun after eclipse as it emits highly hazardous rays. While in Photographing, do take proper precautions to safeguard your eyes. The sun when viewed through the view finder of the camera might affect the retina of the eyes, which might even be a cause for losing our eyes. One of the most widely available filters for safe solar viewing is shade number 14 welder’s glass, which can be obtained from welding supply outlets. Hi, Suganya. This year 2009 , August 6 th , lunar eclipse is visible in melbourne, australia? What are the timIngs pls. The information was very useful. In Karnataka we were not fortunate enough to watch the total solar eclipse. However we were able to watch partial eclipse when the sun was cover about 60 % by moon. we enjoyed the live telecast. Thank you for this info … I was running around last night trying to see anything and did not know that I was not going to be able to see because I just saw your fantastic site today! Thank you.. Many questions about omens, and what families/expeted parents should do on the day of an eclipse. This is a GOOD omen (not bad). You should celebrate the event, and enjoy the day. You are lucky to live in interesting times, to see fascinating and beautiful natural events. Bad omens are created by man (clearcutting of forests, polluting the oceans, exhaust to cause global warnings). When we destroy God’s creation it will haunt us in unexpected ways for many generations. Good omens are created by God – celebrate them, mark your calendars, remember them for years to come. do you see the eclipse here in the philippines?? is thr an eclipse in srilanka?if so,can i pls hav the timings for the 22nd july? huy there i was able to view alittle bit of it here in guangzhou early in tha morning. it was crazy , aint seen something like that in a long while. eclipse will NOT be visible in North America as it will be night time here..
so please try and read these before you ask again! the Solar Eclipse takes place from 2:39 till 4:15pm today! Can you tell me what time the eclipse will take place in Washington, D.C. (EST) on July 22nd 2009? Can you list the timings if the eclipse on july 22nd in Texas,America? I can’t wait to see the solar eclipse that’s coming soon. It’s going to be my first time seeing the solar eclipse!!! I read on the some websites that it’s going to be the longest solar eclipse of the year! Thanks for great infromation about Total Solar Eclipse July 22nd, 2009.
can i know at what time the solar eclipse is occurred in london. When does solar eclipse occur in USA,Florida,eventhough it is not visible.Can u please tell me the exact timing? Good Evening Sir/ Madam, Please let me know what to do on the eclipse time my wife is pregnant. Please let me know soon. Can any one please tell me the timing of total eclipse of 22nd july, in PAKISTAN????????? Thanks for youe reply. One more query, even though the eclipse of the 22nd July is not visible in Europe, please can you advise on the time that we would be experiencing this eclipse here. will it be visible in Kansas city, USA?